With a long weekend, longer days, and the impending Regiolis invasion it was time for another driving trip over to France. An earlyish start to take a morning Shuttle 'Sur le Manche'. Things didn't get off to a good start- 30 minute delays on arrival at the Folkestone terminal which had lengthened to 50 by the time we finally got on the move with 9007 and 9838 providing the power. This delay meant that 'Plan A' was already in tatters and 'Plan B' was looking decidedly dicey by the time we had somehow managed to miss the turning onto the A26 (only the main motorway to Paris!). 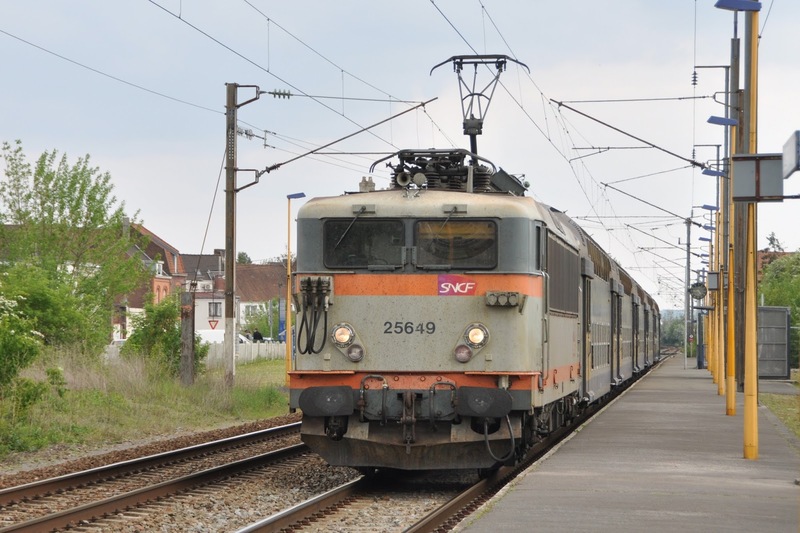 Then due to a car parking disaster we made it to Lens just in time to see see the 13:54 Lens-Lille depart as we ran down the platform... Fortunately this was enough to positively identify that it was a cart vice BB25500 anyway. Missed a freight while at a vending machine and having decided that the station was not in the least bit photogenic decided to head down towards Arras. With one of the two BB25500 diagrams confirmed as plastic attention turned to the other and the 14:35 Hazebrouck-Arras was duly photographed at Vimy in fantastic light... with BB25649 on the back. Still... at least it HAD a loco! 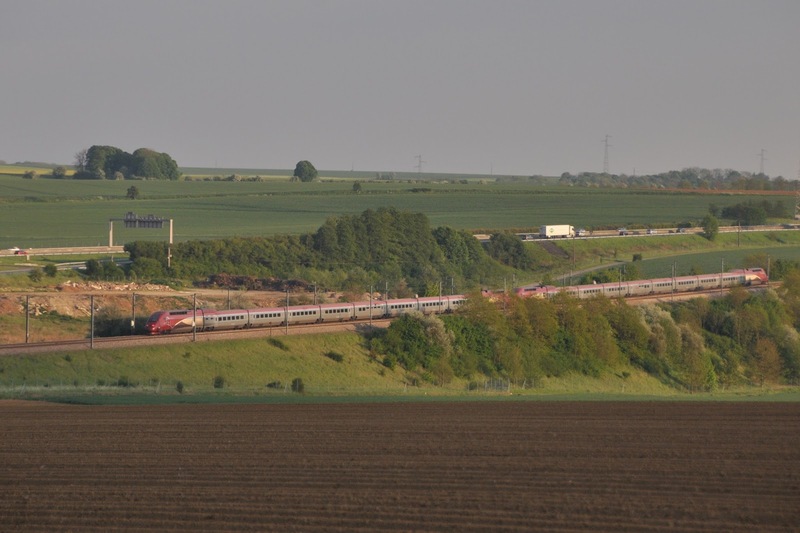 What else did we see in our time at Vimy... well... a ghastly 'Vermillion' TGV... as for Freight. Nothing. Drove on to Arras and then took BB25649 back to Lillers- opening window, front coach, proper loco- Finally things were going a bit better! Unit back as expected, but somewhat surprised to see as we were pulling out of Lens another 'Concrete' BB25500 sitting on stock ready to leave. A bit of detective work suggested that it must be the 17:54 to Lille... the booked diagram... which was a cart earlier! Must have been a set swap at Lille!? Leaving Arras a pair of BB60000's were seen with a freight in the distance. As our loco count for the day totalled precisely one we parked up and waited for 60046 and 60136 to pass with their cereal train. Next target was the LGV Nord. A short drive from Arras found us in a nice rural location near combles (where the A1 and A2 motorways meet) where the sun came back out and we enjoyed a pleasant couple of hours photographing TGV's (thankfully almost all still in the nice colours) Thalys and Eurostar sets. 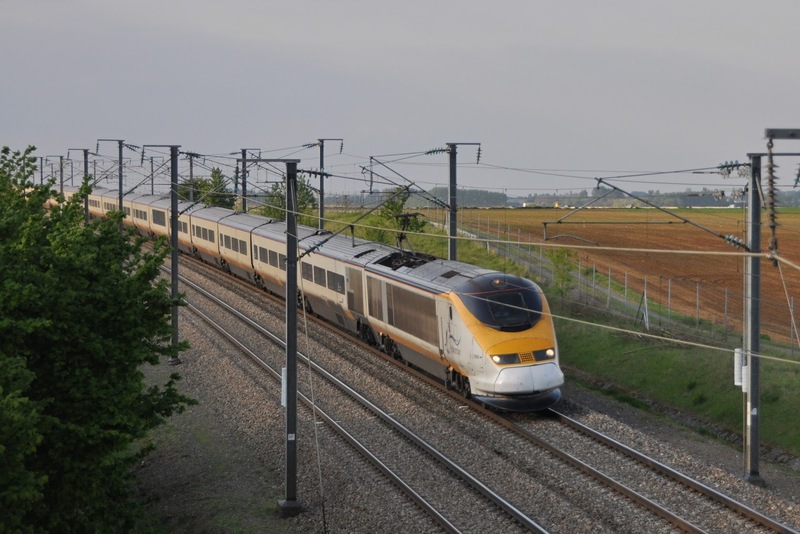 As an added bonus Eurostar 'spare' powercar 3999 was also photographed on a train. Finally with the sun almost set it was time to head for the regular accommodation- Holiday Inn at Amiens, via a stop for some food in Albert. Not an awful first day. It was up fairly early to drive the short distance to the other side of Amiens for a shot I had looked up online. Simple? Apparently not. Amiens is a sea of traffic lights which insist on holding traffic for an unfathomably long time- This coupled with driving to the wrong location resulted in us arriving around 3 minutes after 2014 07:04 from Amiens should have passed (altered timetable taken into account). A few minutes later an AGC came along. 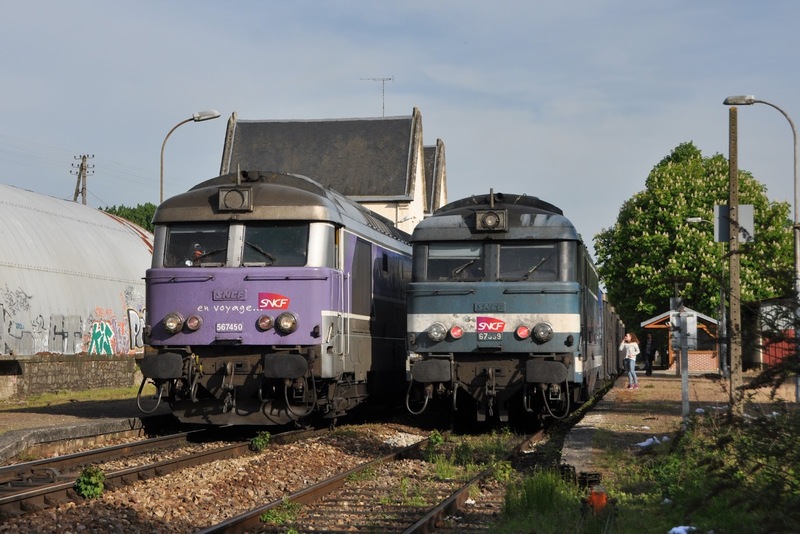 Was this a local TER or had the block between Amiens and Longueau caused the train to be a unit? Either way... time to retreat back to the hotel for Breakfast. 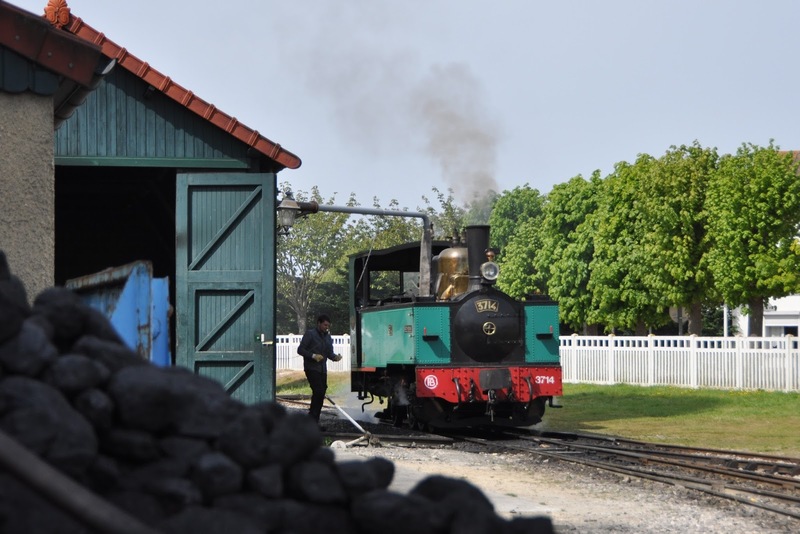 Next we would try our luck at Longueau depot. Cue the beginning of ingenious (and semi successful) methods of trying to photograph the stock in the depot over the boundary wall. Some while, quite a few funny looks, and quite a large blood stain on my trousers later we were content-ish enough to journey on. BB15029 was seen on a double deck set at Longueau station- it didn't look about to go anywhere. A race up the motorway to Noyelles was next on the agenda. By the skin of our teeth we made the 11:30 departure and took 3714 to Le Crotoy the the Somme Bay Railway for a very pleasant hour lunch break and stroll by the sea. 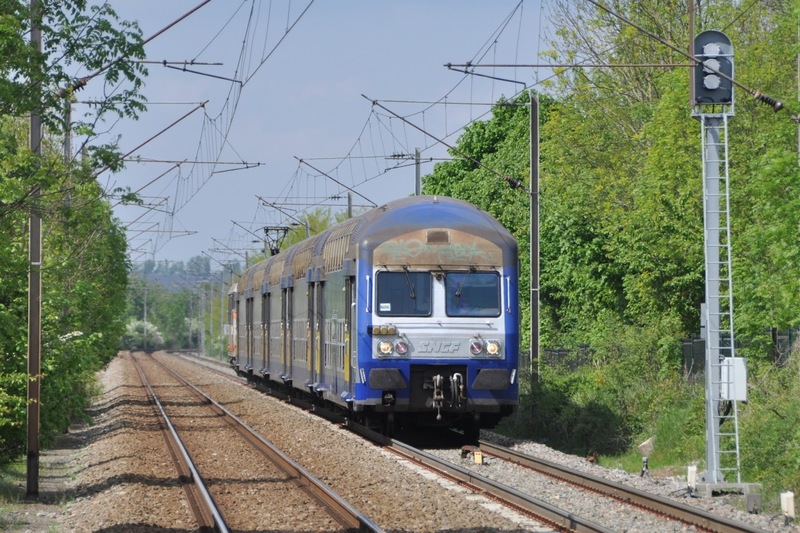 Back at Noyelles at 15:00 it was then time for the real Boulogne line action to begin! A really fantastic day despite the somewhat questionable start. This was potentially going to be my last session on the Boulogne line- but it was so good that I just know I will come back again before the Regiolis invasion. 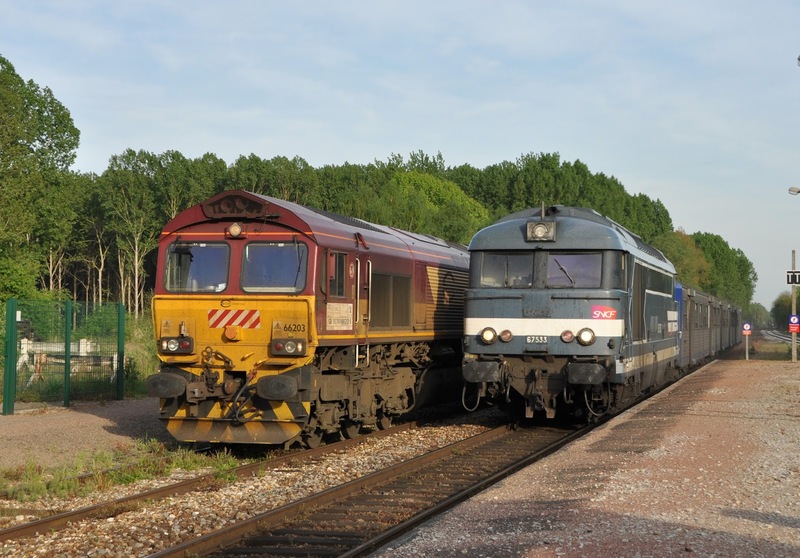 BB67599 hauls the 12:30 Amiens-Creil near to Dommartin. A very early start for me with the intention of getting some haulage before starting the car chase. Set the alarm for 05:50 to make the 06:18 Amiens-Laon. Thankfully the Holiday Inn is literally next to the station- but even so one can imagine my pre-breakfast 'joy' to discover that the train was a cart. Off to Ham on some rattling junk- glad I brought my biscuits. 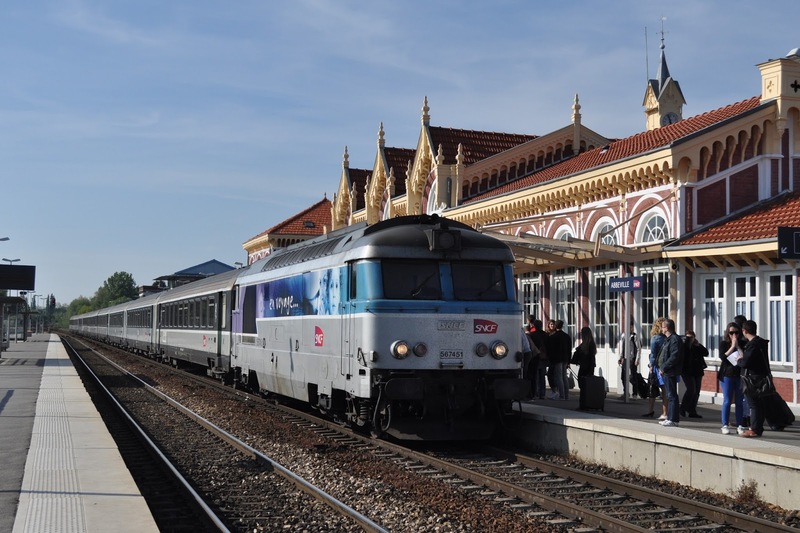 Every cloud has its silver lining and the +10 connection at Ham onto the 6:41 Laon Amien produced winner 67446. Unfortunately only a couple of stops back towards Amiens the 'thrash compartment' was invaded by normals wielding bicycles. In one swift move I managed to give up my seat and was then asked to close the window. Smooth. After breakfast it was my other 'fill in bash'- the 08:42 Amiens-Paris (ex Bolougne) produced Concrete 22349. 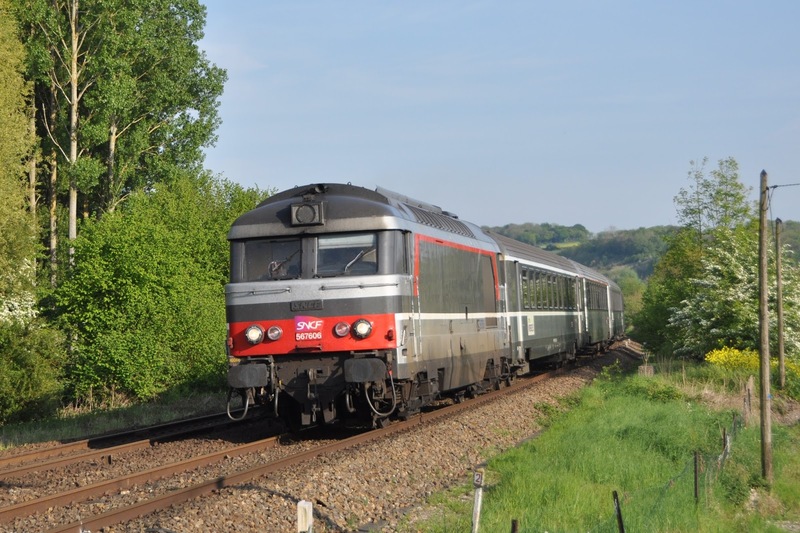 This was taken the whole way to Longueau (which was a stagger over speed restrictions following the weekend digging) Back to Amiens was dud 67614 on the 08:01 ex Creil. Back to the car and time to get chasing again. 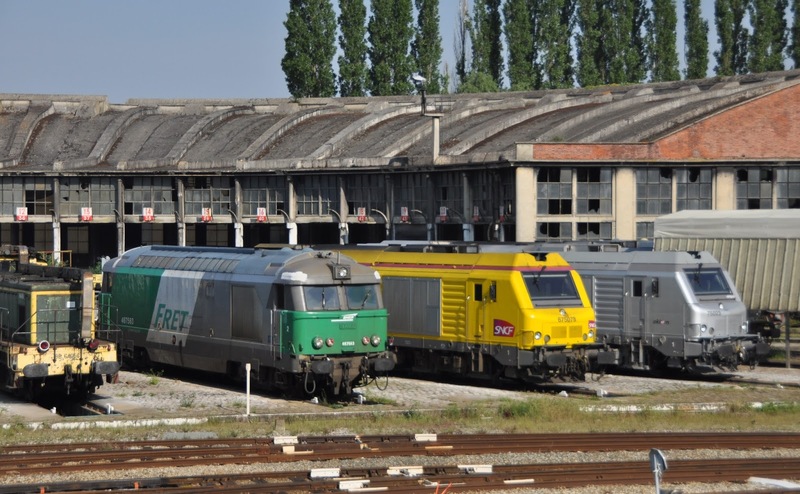 Vossloh Euro 4000 E4022 working for VFLI was seen near to Longueau parked up. We headed south and found a nice location on the main line from Amiens to Creil. Now we needed some trains. A lot more of absolutely nothing then followed until 67599 on the 12:30 Amiens- Creil. Just as we were heading back to the car (naturally) 27087 and 27069 appeared with a freight. Fortunately this happened to be the worlds slowest freight train which allowed me to run back to location for the shot! Nice! 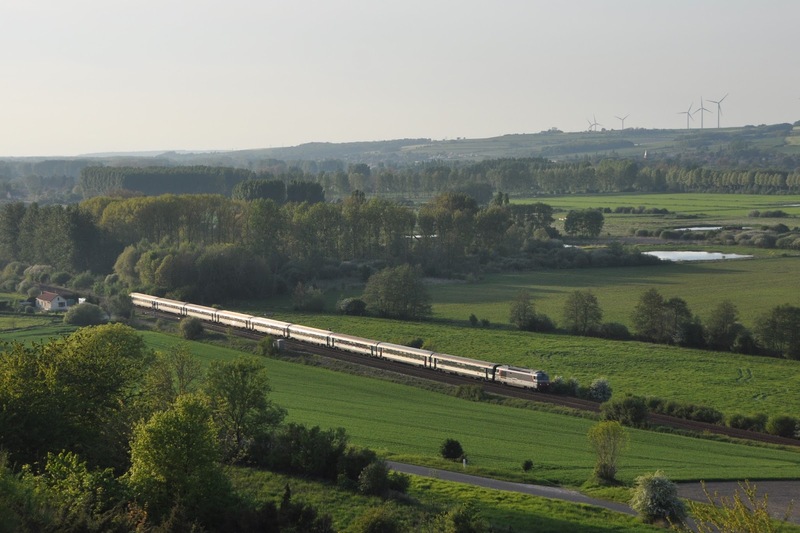 BB67414 hauls the 14:59 Amiens-Laon through fields close to Nesle. 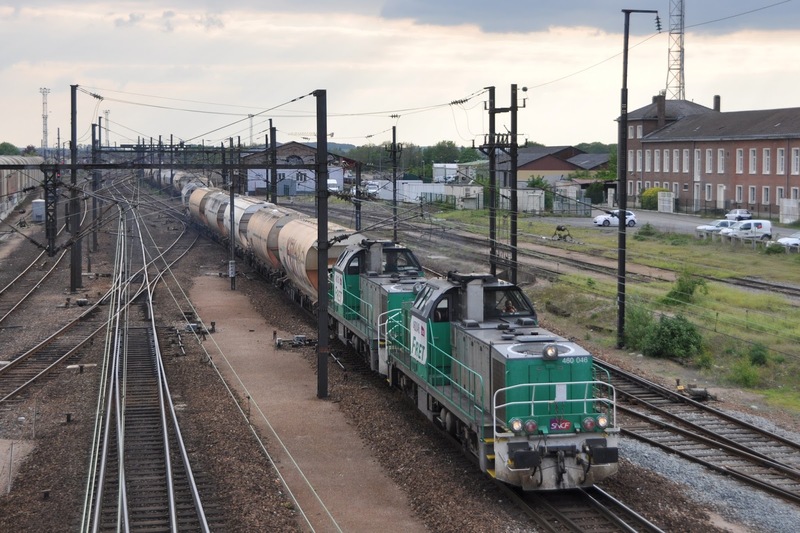 Having passed three freights within 30 minutes during my morning run to Ham it was decided to head to the Amiens-Laon line for a few hours as it is full of photographic potential. Of course this being France things didn't go to plan and we saw a whole lot of nothing plus a single AGC unit in the two hours prior to the 14:59 Amiens-Laon. Had the diagram stuck this should have produced blue 67446- but instead 67414 produced- This multiservice loco annoyingly having been extensively photographed the previous day- and even more annoyingly having a small body panel fitted the wrong way round thus ruining the livery somewhat. Still... it was a good shot. Back to the road for an evening on the Creil-Beauvais line. By the skin of our teeth (again) we made 67599 at Rochy Conde with the 16:53 ex Creil passing 67522 on the 17:22 ex Beauvais. A lot more getting lost followed as it turned out a key road was shut and my google print out was missing rather a lot of other roads. I am still not convinced I know my way around the town of Berthecourt despite having circled various parts of it three times. Things were getting desperate and we eventually found our way back to Rochy Conde (definitely not the plan) for 67533 on the 18:30 ex Creil. There was something of a surprise waiting for us at the station... sitting in perfect light the very familiar shape and colour of an EWS class 66. 66203 (which we had briefly passed at Bresles on the drive down was sitting in the station loop on a train of bright red hoppers. Now if there was one location I didn't expect to see freight... this was it! 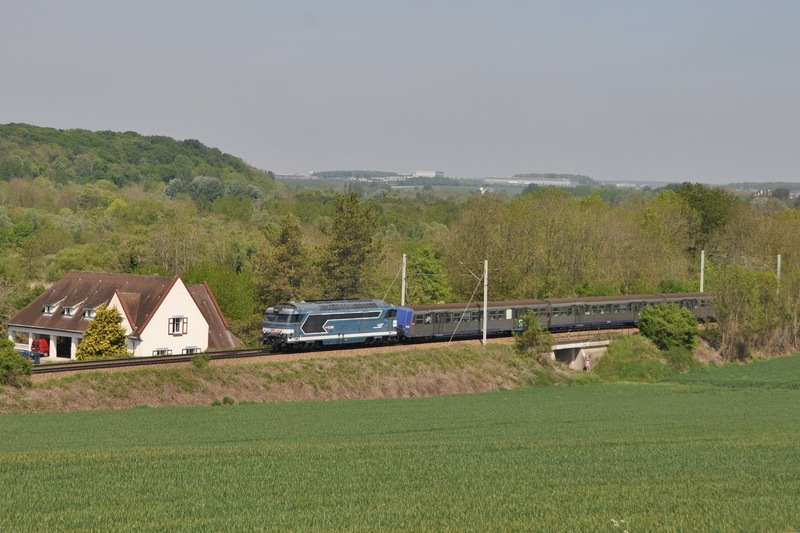 A nice 'UK/France' comparison shot was taken of the two trains passing. One final location was sought for 67614 with the 19:03 ex Creil though truth be told the light was really failing by this point. The 'shed' was then seen to be running round ready to take it's train down to Creil and onward. We on the other hand needed to hit the road. It was already getting tight to make our Eurotunnel check in at Calais but a good run saw us back in time, travel back to the UK being with the same locos as we had out- 9838 and 9007. 'Euroshed' 66203 stands next to BB67533 at Rochy-Conde. The later is working the final leg of the 18:30 Creil-Beauvais. That was a lot of driving!!! As can often be the way France did feel like fairly hard work this time. Fortunately the light was perfect for most of the trip and a lot of desk/google research back home resulted in me getting almost all of the shots I really wanted on this trip, and in good light. On the downside virtually nothing else showed up at all! Despite my good feelings about it the Amiens-Laon line was really very disappointing. Surely one freight in the space of 2 hours wasn't too much to ask? I'd even have taken some units turning up such was the level of desperation at one point! The days of the diesels out of Amiens (and thus trips like this) are definitely numbered now so I'm glad I did make the effort here. As I have said before the Bolougne line on Sundays with 4 locos out on trains is an absolute joy and being so close to Calais is viable even as a day trip from the south east of the UK.